Looking for a piece of jewelry with more of an industrial kind of vibe? Then you might want to consider this cross necklace. It's made out of slightly dark grey titanium, and has a brushed finish to give it that little something, and it hangs on a 22 inch chain that ends in a simple to use but elegant looking lobster clasp. The design doesn't end there, however; on each limb of the cross is a screw set into the metal, giving it that industrial look that you might have been looking for. The screws themselves are very simple in design, so you don't have to worry about it looking specialized. This great titanium cross necklace has a brushed finish with a screw detail at each end. Pendant measures 26mm (1") x 19mm (3/4") and comes with a 22 inch 2mm stainless steel curb chain. 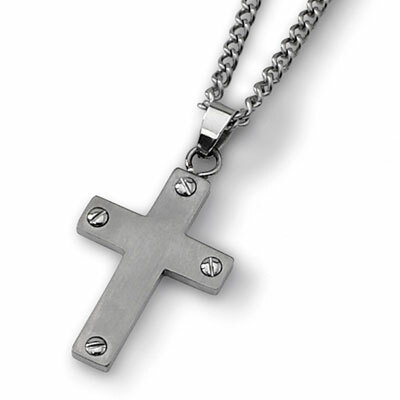 We guarantee our Titanium Cross Necklace with Screw Detail to be high quality, authentic jewelry, as described above.